Interactive prototypes that showcase unique labour market insights. T-Level routes can be mapped to occupations, which can then be mapped to regional labour market demand. 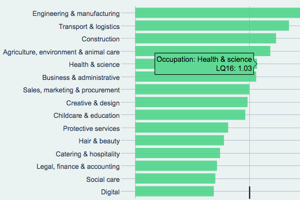 Find out in these interactive graphs what the T-Level specialisms are in your LEP region. 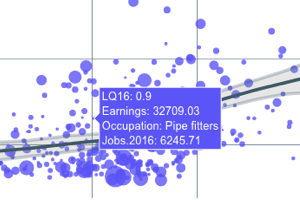 Take a look at our interactive charts showing the link between jobs and earnings, and how an area voted in last year’s referendum. Which Local Authorities are most similar to yours in terms of their industrial mix? Use our interactive chart to find out the answer.